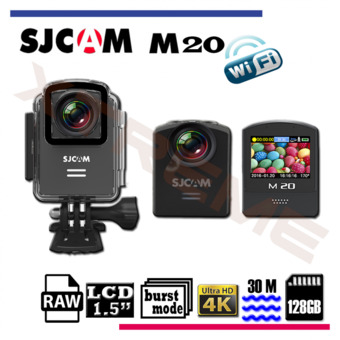 The SJCAM M20 is SJCAM’s smallest action camera to date. Weighing in at just 55 grams the M20 truly has a miniature form factor. But do not be fooled by the M20’s small size. The camera is one of SJCAM’s most feature robust products ever. Powered by a NTK96660 processor, the M20 takes vivid pictures, and awesome 2,5K videos, via its Sony IMX206 16 mega pixel sensor. Other hot features include Gyro stabilization for smoothing out the bumps when shooting high definition video, adjustable FOV, fish-eye correction function, and quick start recording, Instant AV-out, underwater mode, double file back-up record, MP4 & MOV video support, and JPG & RAW picture output. Moreover, M20 is the first SJCAM camera to support a bluetooth remote controller. OEM FHD กล้องติดรถยนต์ WDR และ Parking Monitor หน้าจอใหญ่ 3.0นิ้ว รุ่น FH05 (White) + แถมฟรี Micro SD 8GB.